The Best Miniature blogs from thousands of top Miniature blogs in our index using search and social metrics. Data will be refreshed once a week.Also check out Top Miniature Youtube Channels list for Top videos on Miniature. NYC, New York, United States About Blog Simple Kids Crafts is a video blog dedicated to making easy, educational recycled crafts for people of all ages. Here we share Dollhouse and Miniature Crafts, General DIY and Doll Crafts. Our blog features crafts made out of recycled and Eco-friendly materials, as well as paper, cardboard, fabric etc. Follow this channel to get videos dedicated to making easy, educational recycled crafts for people of all ages. Facebook fans 2,018. Twitter followers 3,770. United States About Blog Easy DIY Miniatures is a video blog dedicated to miniatures. Here you will find miniature creations, tutorials and much more. Learn how to make toy miniature, kitchen miniature, miniature dollhouse & miniature household items. About Blog Tanja Jensen makes dollhouse miniatures and other minis suitable for dolls as well as a few other DIY type projects every now and then. You'll find lots of how to videos using polymer clay, fabric etc. Miniature food, doll clothes, repaints, dollhouse furniture, miniature animals and more . Facebook fans 8,827. Twitter followers 457. About Blog The National Museum of Toys and Miniatures exhibits and preserves one of the largest collections of antique toys and fine-scale miniatures in the world. Facebook fans 4,581. Twitter followers n/a. About Blog Welcome! I`m Yolanda Meow. I have created this channel with love to show you how to make cute tiny miniatures to your dolls, to decorate a shelf, make a gift or even make them just for fun or because you like & love to collect miniatures like me. Facebook fans 751. Twitter followers 121. About Blog Hi friends, my name is Sunny. This channel is about diy miniature tutorial. About Blog Hi, my name is Elizabeth! I am 20 years old. Welcome to my blog for creating doll miniatures from simple materials! About Blog I've always had a love of art. When I was a child, my paternal grandmother used to take me to art classes in Chicago, where I learned to paint with oils and draw with pastels. In August 2009, I renovated my childhood dollhouse for my young cousin and was bitten by the miniatures bug! I've been building scale models ever since, and that is where most of my creative energy is spent these days. About Blog Hi! Welcome to my blog! I'm Kristine, a photographer and modern minis enthusiast living in Canada. Paper Doll Miniatures is a blog to document my miniatures and connect with other mini makers. Facebook fans 368. Twitter followers n/a. About Blog In 2009 I decided to build a 12th scale pub to house a collection of action figures owned by my Husband. By 2010, frustrated by the lack of contemporary miniatures available, I began making the accessories I needed to furnish the pub. This blog chronicals everything I make and how I make them. United States About Blog Youtube channel for Dollhouse miniature. US About Blog Miniature wargaming blog with a hobby focus for miniature painting & tutorials. Facebook fans 240. Twitter followers 631. Michigan, USA About Blog Mengel Miniatures is your home for all of the best hobby content, reviews, interviews, tutorials, painting galleries, and anything wargaming related. It is also home to the Mengel Miniatures Painting Studio, a high-end commission miniature painting service operated and founded by two time Golden Demon winner Tyler Mengel. Facebook fans 734. Twitter followers 3,796. About Blog Popular miniature painting website with articles, tutorials, galleries of painted miniatures, and an active community based on our discussion forum. Facebook fans 3,481. Twitter followers 1,240. Orlando, FL About Blog My name is Mat, and I am actually a graphic designer by trade. I took this opportunity to learn 3D design and made a website for miniature construction equipment with the mini cinder blocks at the forefront. After experimenting and developing different designs, I settled on the main product in 1:12 scale and began building the mini empire, block by block! Facebook fans 2,655. Twitter followers 164. McKinney, TX About Blog Bombshell Miniatures was formed in 2012 to offer a dedicated range of unique character models suitable for use in many tabletop and roleplaying games as well as for collecting and painting. Facebook fans 3,698. Twitter followers 213. About Blog I'm just an arty gal with my head in the clouds, sowing seeds of wonder and delight. Art, craft and other mess making inspired by the magic, make-believe, faeries and nonsense at Pixie Hill, home and studio of arty gal Nichola Battilana. Facebook fans 5,602. Twitter followers n/a. About Blog I've been modeling, painting, and playing with toy soldiers since 1991. Over the years I've painted thousands of miniatures, primarily for Games Workshop's games, but I've also tackled some great historical miniatures. You can keep up with my current projects here on this blog. About Blog Cinderella Moments began November 23, 2008. It wasn't until April 2010 that I finally gave in to making dollhouses. It's been nonstop mini cottages since then! My love for houses, design, and architecture has always existed. I love tiny details, cozy atmospheres, sophisticated touches. With each of my cottages I try to bring out that inviting, irresistible charm. Facebook fans 5,574. Twitter followers 2,771. About Blog I do commissions for painting, conversions, you name it. I made this blog with the intent of tracking my work and progress along with whatever else I think is related to the miniature hobby. About Blog Hi, my name is Kris and I make minis. I love to share what I make and this is where I do the sharing. I try to have a tutorial up by the 20th of every month. I make the mini accessories out of paper, mostly. If you are new to this blog be sure to search the entire blog. Learn how to make miniature dollhouse furniture, mini paper accessories and get techniques, tips and monthly tutorials. About Blog Miniature blog by Scott MacPhee. Scotland, United Kingdom About Blog Whitewash Studio provide a commission painting service that will have your models ready for the tabletop, and there is nothing better than playing with a fully painted miniature army. Facebook fans 358. Twitter followers 66. About Blog 1:12 scale dollhouse tutorials, Free miniature furniture templates and with some great building tips too. Facebook fans 660. Twitter followers n/a. About Blog A blog about miniature painting. A place to showcase my painted miniatures and share my work in progress. About Blog I am a modern miniatures addict. I'm renovating several dollhouses and working on designs for a case study inspired house. I blog about all of the cool modern miniatures I collect and find and hope to share this passion with anyone interested. Facebook fans 9,660. Twitter followers 68. About Blog This blog started out as a way to document the process of creating a Miniature Setting for the Philadelphia Flower Show. It has developed into a blog about miniatures in general and a consideration of why miniatures are so prevalent in our culture. It takes the stance that, properly constructed, miniatures are like stage sets or movie sets that invite the viewer to visit an alternative place. About Blog I am an avid miniaturist. This blog will be devoted to minis! And where I am on my numerous projects. I hope to post tips that will help miniaturists and also learn from other mini lovers. I create minis for pleasure only, not for sale (thus far). I am always learning, so my projects are not picture perfect. But the idea is to have fun and try to create something beautiful along the way. Denmark About Blog I am Annie, miniature creator behind WeLoveMiniatures. I make handmade miniatures in scale 1:12 and video tutorials on how to make my miniatures. Facebook fans 1,494. Twitter followers 147. About Blog The Guild School an educational activity of the International Guild of Miniature Artisans. IGMA was founded to promote fine miniatures as an art form; to increase awareness and appreciation of high-quality workmanship through public education, to recognize and honor qualified artisans and encourage work of highest quality, to encourage the development of new artisans; and to coordinate and serve. Facebook fans 1,266. Twitter followers n/a. About Blog Greggs Miniature Imaginations is dedicated to different craft projects that I am inspired to create, from my unstoppable imagination and love of miniatures. About Blog Welcome to my blog! I am an artist and a metalsmith. I have always loved miniatures and dollhouses. My interest in making miniatures is not restricted to the metal work I do. This year I plan to design and build a dollhouse. I do not sell the miniatures I am making right now while I am trying to build my own collection. About Blog I am a Swiss miniature model builder, in dollhouse scale 1:12. I design houses and interiors just for the fun of it! And I share 3D-printed modern scale furniture on Shapeways.com. Toronto, Ontario About Blog My name is Travis Keeler & I'm a miniature wargame enthusiast currently living in Toronto Ontario. I adore everything about miniatures and can think of no better way to spend an afternoon than with brush or dice in hand. Facebook fans n/a. Twitter followers 245. About Blog A blog about wargames, miniatures and terrain. About Blog In this blog you will find 700 videos/slide shows, of dollhouse scale miniatures, created by some of the most talented miniature artists & enthusiasts, from all over the world. There are currently 213 tutorial videos and more are added every month. About Blog A blog about making and collecting 12th scale dollhouses and miniatures. About Blog I'm a mom. I'm a jack of all trades, and a master of some! My passion for making things began in childhood. As the years went on, school, work, more school and life got in the way of being crafty and creative. Now that life has settled down, I have a little one at home who has inspired me to find my creative passion once again. Facebook fans 111. Twitter followers 301. About Blog Welcome to Tim's Miniature Wargaming Blog. Here you will find reports (and pictures!) of games I have played as well as news (and pictures!) about my current modelling and painting projects. 41. Nancyland | Graphic design & modern miniatures. About Blog That state of mind where all things are possible. Some are in the process of becoming, while some have already been. Designer and modern miniaturist Nancy Enge shows her work here. Shimla, India About Blog A fun and creative way to pursue gardening as a hobby. Its therapeutic! Facebook fans 4,115. Twitter followers 5. About Blog I am a wife and mother of two - Noah and Liberty. I am a party planner, miniaturist, scrapbooker, an op shopper and pretty much a crafter of anything. I make dollhouse miniatures in 1:12 scale just for fun! Facebook fans 2,592. Twitter followers n/a. About Blog Fearless adventures in collecting, sculpting and painting miniatures. If you love old school 1980s Citadel miniatures this is the place for you. About Blog A miniature blog of 1:72 scale wargaming & miniature modelling. Facebook fans 1,418. Twitter followers n/a. About Blog My name is Joanne. I started doing minis back sometime in the 80's although I am not sure of the exact time. I have always loved small things and I have always done a variety of crafts. With the minis I found I could use all the skills I had developed in all the other things I had loved all in one place. About Blog My name is Celia Thomas and welcome to KT Miniatures. Here you will find miniature creations. About Blog Shabby Chic, Vintage, Cottage inspired dollhouse miniatures. In this blog, you will find my journey as I build new items and share tutorials. About Blog I have been fascinated with miniatures since I was a small child. I strive for attention to detail and authenticity to 1/12 scale and realism in all my displays and love vintage and antiqued items. Paper is my favorite medium. I am in awe of how many ways paper can be manipulated and distressed to give a vintage feel to any piece. Facebook fans 938. Twitter followers n/a. About Blog My name is Drora. My hobbies are dollhouse miniatures, classical music, folklore arts and crafts from all over the world. My interests are languages and books. I collect dollhouse miniatures and also make some myself. About Blog A blog about modern miniature doll houses and things related. Marsaskala /Malta About Blog Hi I am Rebecca Micallef from Malta. I have been building dolls house and miniatures for 20 years and it's still my favorite hobby. It all started when I was around 4 years old when my parents gave me my first dolls house. From that day I never looked back. Facebook fans 16,731. Twitter followers 43. About Blog Welcome to Bistro Miniature!! We feature miniature dishes that are made with fresh ingredients, resulting in amazing edible dishes! New video goes up every Friday. Facebook fans 870. Twitter followers 341. About Blog Hi, I'm Lena Pipes. Welcome to my little peaceful crafting galaxy! I mostly do miniature crafts for dolls and LPS. I love dollhouses and tiny realistic miniatures. My goal is to entertain you! Facebook fans n/a. Twitter followers 17. About Blog Miniature-Gardening.com offers a variety of accessories, fairies, plants, garden tools & furniture to create enchanting miniature landscapes for containers or your yard. We carry the largest online selection of plants for miniature and fairy gardens and of unique handcrafted miniature hardscape paths and patios. Facebook fans 6,211. Twitter followers n/a. Singapore About Blog I’m Pei Li, an aspiring dollhouse miniatures artisan. As a young child, I have always been interested in crafts. When I started attending some clay classes locally and overseas several years ago, it ignited my passion to seek and learn more, especially in making 1:12 scale dollhouse miniatures. A dollhouse miniatures blog specializing in air dry clay, dollhouse miniature food and flowers. Facebook fans 8,589. Twitter followers 559. About Blog Miniature food artist making delicious-looking mini treats from polymer clay for you and your dolls. Facebook fans 8,199. Twitter followers 1,031. About Blog An interesting blog about dollhouse miniatures. Amazing dollhouses, interesting collectors, and quirky uses of miniatures. Facebook fans 6,747. Twitter followers n/a. About Blog Each year, the Show brings together more than 100 U.S. and international artisans and dealers, including a number of I.G.M.A. Artisans and Fellows. They offer collectors unique, well-crafted 1-inch, 1/2-inch, and 1/4-inch scale miniatures from around the world. Facebook fans 1,902. Twitter followers n/a. Sydney, Australia About Blog Hi, Iam Norma. I'm not sure if I should describe miniatures as a hobby or an obsession, but it's the best escape from the cares of the world that I know - and an opportunity to indulge a love of vintage decor without breaking the bank. Facebook fans 1,080. Twitter followers 5. About Blog A Miniature Warfare blog for miniature creations. Facebook fans 1,078. Twitter followers n/a. Facebook fans 889. Twitter followers 9. About Blog A blog for the dollhouse and miniature enthusiast. As anyone involved with doll houses and miniatures knows, it takes passion, and a certain amount of obsession to detail, to create the perfect look - you could say creating miniatures is my slightly out of control hobby. I create my unique 1:12 scale miniature books as ‘real’ books - not balsa wood with a stuck on cover, or blank sheets of paper. Facebook fans 535. Twitter followers n/a. Facebook fans 533. Twitter followers n/a. Orlando, FL About Blog Miniature Expressions is your one-stop-shop for miniature fairy garden gifts, home & garden decorations, and original collectibles. Facebook fans 77. Twitter followers 3. About Blog Sharing the delight of the miniature hobby that I enjoy. It is nice to step away from the real world and enter a small world that makes me smile. Facebook fans 76. Twitter followers n/a. Canberra About Blog I'm an artist who works in miniature. My work has been published internationally, both in print, on television and online. Facebook fans 26. Twitter followers 111. About Blog Hey there. I'm Holly, owner and creator of Miniatures Absolutely on youtube! I started this blog in 2016 to catalog my inspirations and projects. I write about DIY, fimo creations, sewing, tropical gardening, and more. About Blog I'm a father, soldier, wargamer and traveler. This site is for my kids and to share my work over half a lifetime musing on the history of warriors and the portrayal of their efforts in miniature. About Blog Welcome to my crazy little world! It's a place where dreamers are always welcome, and no idea is ever far fetched. I regularly post progress on my current projects, and have links below to finished and future dreams. My Miniature Madness is all about the love of miniatures in all scales from 1:12 to 1:144! This site is a place to share ideas, tips, tricks, techniques. Facebook fans 23. Twitter followers n/a. About Blog Learn Miniature from scratch. About Blog This blog is to display all of our modelling and wargaming efforts that are Napoleonic related. About Blog A Bob's Miniature Wargaming Blog . About Blog I'm really into making all kinds of miniature food, I love finding my own way and keeping things new and original. I have fun getting my own ideas, but I love any suggestions! My aim is making miniature food to look as real as possible! About Blog Since I was a little boy I was fascinated by toy soldiers. In 1987 I started with 30mm flats and after a few years I found interest in historical tabletop-minis. I´ve only been painting them until 2010. Now I found some comrades to join the world of tabletop so my figures are now able to fight in historical battles. About Blog A blog about miniatures, cats, stitching and more miniatures and cats. About Blog Hi, welcome to my blog! I have been inspired to start my own blog to showcase some stuff that I am doing, but also to show the work of others that inspire me. It will be mostly dollhouse miniatures, but other stuff as well that I come across along the way. About Blog My name is Lidi and I live on the beautiful mid-north coast of New South Wales, Australia. I love all things miniature - my favourite scale is 1:12th - just because I love the detail and my favourite period is “any time” as long as it is characterful and grungy. About Blog A chronicle of my adventures in the world of miniature dollhouses. About Blog Hi, I'm Monique and live on the beautiful westcoast of Holland, that's also fabulously small ;). I love to create whatever possible and my mind's always full with of all sorts of ideas. Due to circumstances I could and can hardly do anything with those ideas, but fortunately since a little while I'm able to make miniatures every now and then. About Blog Latchkey and Jonquil is your home for all of the best hobby content, reviews, interviews, tutorials, painting galleries, and anything related to miniature. About Blog Big and Little Creations is for dollhouse and miniature lovers of all scales and crafters in general. See miniatures in a variety of ways from remakes, to scratch building and fun contests etc! About Blog I blog about anything from digital art to 1/12th scale miniatures and photography! I also have a blog specifically for my photostories which is updated less often now as I haven't as much time to dedicate to my stories as I'd like. About Blog A Miniature Design blog by Elizabeth. About Blog Hi! Welcome to minibase. I love miniatures since I was a child, so I decided to create this little blog and share my passion with all of you. I love to create modern scenes with a lot of details mainly in 1/12 scale, which I will try to share on this blog. About Blog A blog about my miniatures and sometimes more. About Blog A Miniature blog by Kathie. About Blog A blog about dollhouse miniatures country farmhouse style, Also gardening, cooking tips, recipes, picking antiques and country life in general. About Blog In this blog you will find my projects, collections, miniatures and free printables. Designing on the computer is my passion and I'm so fortunate to share my designs through my online businesses of miniatures and digital downloads. I've been making and designing miniatures for over 30 yrs and my wonderful husband John helps with the business too. About Blog A miniature blog by Irene. About Blog I'm Robin Britton and I work from my home in the market town of Thame in Oxfordshire. I have been creating original miniature dolls for around 25 years, and for most of that time sculpting individual and original characters in polymer clay. About Blog I collect antique dollhouses and miniatures. I also collect modern miniatures. Facebook fans n/a. Twitter followers 92. About Blog We have been involved with miniatures for about 15 years – since Ron bought Felicity a dolls house kit one Christmas! At first it was just personal time for Felicity on Sundays in the busy lives of two primary school head teachers and parents of two growing boys. About Blog A miniature blog by Joane. About Blog All about the wonderful world of modern miniatures and design. I live in the north of Israel .I love doll houses and dolls ever since I was little - especially contemporary doll houses. About Blog I read the New York Times article about modern miniaturists and became inspired. I loved my childhood doll furniture and now I get to play with it again. It tickles me to add a bit of goofy humor. About Blog Dollhouse Miniatures Blog with tutorials about dollhouse miniatures minis miniature hobby. I have been a miniaturist since middle school and love to work with fabrics, paper, and found objects. I also have a website where I have indexed articles from my 30 year collection of Miniature Collector, Nutshell News and Dollhouse Miniatures. About Blog This blog is about my love for dollhouses and miniatures in 1:12th scale. I've started with this hobby a long time ago and ever since, I've learned a lot about this hobby, but mostly I've learned to get to love that little world more and more. It's magic, it's an escape from the real world, it's just the way I want it and nobody get's hurt in this world, no bad things happen. About Blog This blog shows the progress of my 1:6 scale dollhouse, Maison de la Royale and the various projects I work on with my dolls and dollhouse collection. About Blog Wargaming miniature blog by Shaun. About - Hasslefree Miniatures creates fantasy Heroes and Heroines, Nekkid Chicks and Nekkid Dudes, Grymn (sci-fi Dwarves), Post Apoc Survivors and Fighters, Sci-Fi Galactic Navy and Adventurers. About - Hi I'm Carol Mitcheson. In 2009 I decided to build a 12th scale pub to house a collection of action figures owned by my Husband. By 2010, frustrated by the lack of contemporary miniatures available, I began making the accessories I needed to furnish the pub. This blog chronicles everything I make and how I make them. About - Follow Goblin Lee's Miniatures Blog to find more on Miniatures. 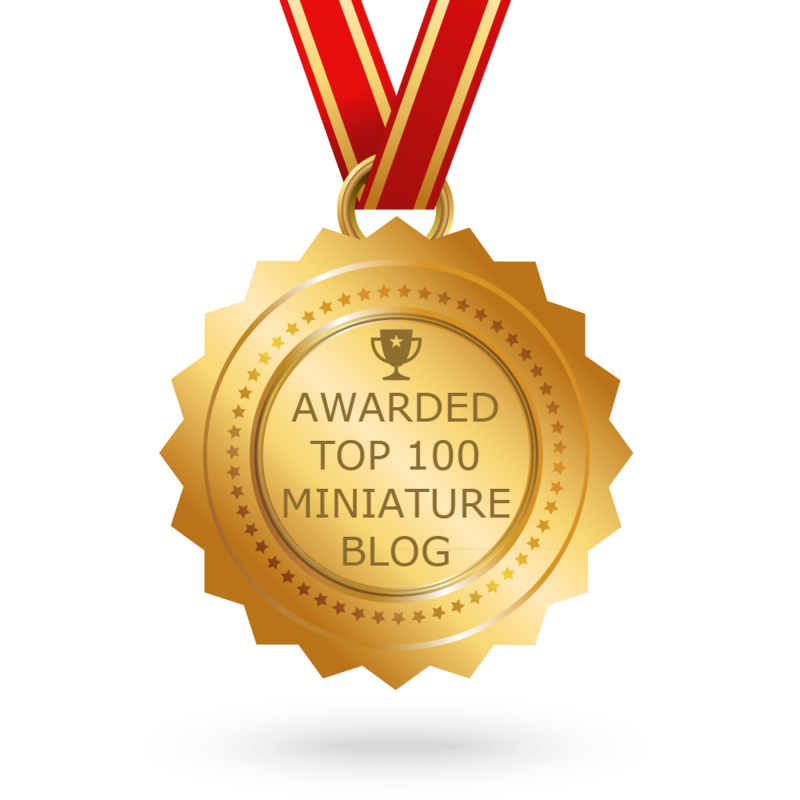 CONGRATULATIONS to every blogger that has made this Top Miniature Blogs list! This is the most comprehensive list of best Miniature blogs on the internet and I’m honoured to have you as part of this! I personally give you a high-five and want to thank you for your contribution to this world.